Counter64 Class encapsulates two unsigned integers into a a single entity. This type has is available in SNMPv2 but may be used anywhere where needed. Definition at line 76 of file ctr64.h. Constructs a valid Counter64 with the given values. Definition at line 100 of file ctr64.h. Constructs a valid Counter64 with the given value (default 0). Definition at line 113 of file ctr64.h. Definition at line 126 of file ctr64.h. 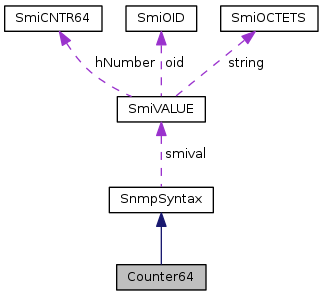 References SmiVALUE::hNumber, SnmpSyntax::smival, sNMP_SYNTAX_CNTR64, and SmiVALUE::value. Definition at line 136 of file ctr64.h. Definition at line 256 of file ctr64.h. A cloned Counter64 object allocated through new. Definition at line 229 of file ctr64.h. The needed space that depends on the current value. Get a printable ASCII string representing the current value. Get the Syntax of the object. This method always returns sNMP_SYNTAX_CNTR64. Definition at line 222 of file ctr64.h. Get the high 32 bit part. Definition at line 179 of file ctr64.h. Get the low 32 bit part. Definition at line 186 of file ctr64.h. Definition at line 165 of file ctr64.h. Always *this with the new value. Assign a Counter64 to a Counter64. Definition at line 265 of file ctr64.h. Assign a unsigned long to a Counter64. i - The new low part. The high part is cleared. Definition at line 281 of file ctr64.h. Set the high 32 bit part. The low part will stay unchanged. Definition at line 193 of file ctr64.h. Set the low 32 bit part. The high part will stay unchanged. Definition at line 201 of file ctr64.h. Definition at line 244 of file ctr64.h. Definition at line 370 of file ctr64.h. Definition at line 369 of file ctr64.h.